Ericsson is introducing a new unified content delivery network (CDN) solution for both fixed and mobile networks. The new Ericsson Media Delivery Network solution aims to integrate the company's advanced packet core and radio capabilities with a converged cache. The solution also adds management and service exposure layers for intelligent control and business model enablement. Ericsson said its goal is to enable operators to enter the media value chain with profitable video delivery and to truly leverage their established consumer relationships. At the same time it offers content providers and enterprises cost-effective accessibility and guaranteed quality of experience across all networks, enabling the delivery of video, web content, and app downloads while accelerating commerce. "Yesterday our mobile devices were telephones, today they are everything; our TVs, our banks, our conference rooms. The recent Ericsson Mobility Report shows that mobile data traffic will grow 12 times by 2018, and this is only the start of the tremendous transformation we will witness. 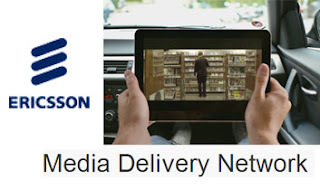 The Ericsson Media Delivery Network solution breaks the boundaries of traditional CDN solutions, offering operators a single, intelligent, and agile management platform for superior efficiency, optimization, velocity of service, and monetization opportunities," stated Per Borgklint, Senior Vice President and Head of Business Unit Support Solutions, Ericsson. In 2011, Ericsson and Akamai Technologies announced an exclusive strategic alliance focused on bringing to market mobile cloud acceleration solutions aimed at improving end-user Internet experiences such as mobile ecommerce, enterprise applications and internet content. The companies will jointly develop solutions for delivering content and applications to mobile devices. Ericsson has subsequently introduced CDN capabilities in its Smart Services Routers. VimpelCom awarded a five year managed services contract to Ericsson covering network operations on VimpelCom's behalf at more than 10,000 sites, as well as overseeing more than 10,000km of optical transport cables and an extensive fixed network across Siberia and the Urals in Russia. Over 400 VimpelCom employees spread over 41 locations across Siberia and the Urals will be transferred to Ericsson in April. Ericsson will be responsible for network operations and field maintenance for active and passive network components, for the operator's mobile, fixed and transport networks. "This agreement meets VimpelCom's long-term plans in strategic programs to increase operating efficiency. The transfer of network maintenance and support to Ericsson will allow us to more effectively optimize costs and network management. Similar projects have already become standard practice in the world, and we are actively supporting this trend, as we see the effectiveness of this model with examples of global operators. We are confident that the knowledge and experience of Ericsson in the extended network service and support, will allow us to maximize our focus on business development, improve the quality of services for our customers and provide additional quality services"- said Anton Kudryashov, General Director of Joint Stock Company" VimpelCom." Mitsubishi Electric has developed an error-correction method for optical communications that achieves a coding gain of 12.0dB. 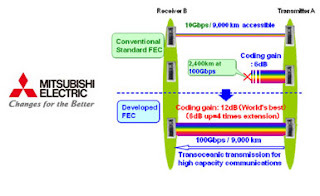 Mitsubishi Electric said its new error-correction technology enables transmissions four times longer than conventional codes, such as Reed-Solomon codes standardized by ITU-T G.709. As a result, the technology enables long-haul transoceanic transmissions, such as those between Japan and the United States (about 9,000km), at 100 Gbps per wavelength for high-capacity communication systems. The new technology leverages low-density parity-check (LDPC) code, which uses sparse parity check matrices for high-level error correction. The R&D was conducted under the "Lambda Reach Project" of Japan's National Institute of Information and Communication Technology (NICT). 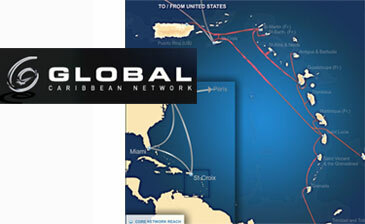 Global Caribbean Fiber (GCF), the main provider of network services across the Eastern Caribbean, is upgrading its Antilles Crossing submarine network with Ciena's 6500 Packet-Optical Platform equipped with WaveLogic coherent optical processors and Submarine Line Terminating Equipment (SLTE). 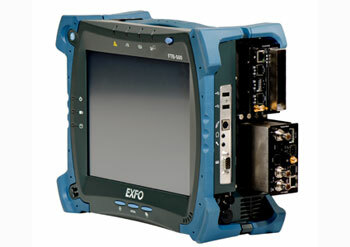 The upgrade, which is slated to be complete in May 2013, uses 40G coherent technology. The upgrade will also use Ciena’s agile GeoMesh optical bypass, which will provide GCF with flexibility to add or drop select wavelengths at intermediate sites. The 1,100 km Antilles Crossing submarine network connects the Eastern Caribbean islands of St. Croix, St. Lucia, and Barbados. 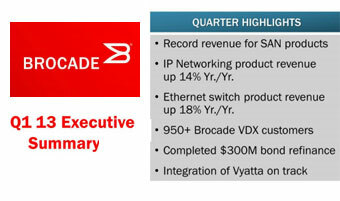 Brocade reported record first quarter revenue of $588.7 million for the period ended January 26, 2013, an increase of 5% year-over-year and 2% quarter-over-quarter. There was a GAAP loss per share of $(0.05), down from a profit of $0.12 per diluted share in Q1 2012. "Brocade achieved record revenue in Q1 based on strong performances in both our storage and IP networking businesses," said Lloyd Carney, CEO of Brocade. "As the new CEO, it is my top priority to ensure that the company continues to execute well in our core businesses to drive growth and shareholder value. Looking forward, I see new opportunities emerging in the networking industry due to disruptive IT market trends that are challenging the capabilities of today's networks. It is clear that customers are looking for new technologies and approaches in networking to meet these challenges. I am excited and honored to navigate the company forward, delivering on these customer requirements in a way that drives top-line revenue through both innovation and operational efficiency." Storage Area Networking (SAN) business revenue, including products and services, was a record $416.9 million, up 3% year-over-year and up 6% sequentially. SAN product revenue increased 3% year-over-year and increased 7% sequentially, led by higher switch and director product sales, in a seasonally strong quarter for the company. Brocade's Gen 5 (16 Gbps) Fibre Channel products represented approximately 42% of director and switch revenue in the quarter. IP Networking business revenue, including products and services, was $171.8 million, up 11% year-over-year and down 7% quarter-over-quarter. The year-over-year growth was driven by solid performances across all three IP Networking product groups and led by Ethernet switch revenue, which was up 18% year-over-year. Routing revenue was up 5% year-over-year and other IP Networking revenue was up 25% year-over-year driven by higher sales of the Brocade ADX Series of application delivery products. The sequential decline in IP Networking revenue was principally due to lower Ethernet switch sales into the U.S. federal government, which is typical in the company's first fiscal quarter. Extreme Networks released the latest version of its modular Operating System (ExtremeXOS v15.3) with new features and support for SDN technology, including OpenFlow and support for SDN applications from partners such as Big Switch Networks and NEC. The company is also shipping its OpenStack Quantum plugin, a downloadable software module providing a rich API for ExtremeXOS that enables orchestration and management of multi-tenant networks providing security, load balancing and data center interconnect infrastructure as network services. The OS supports Big Switch Networks' Big Tap, which provides traffic monitoring and dynamic network visibility with flow filtering, and Big Virtual Switch (BVS), an application for virtualized data center networks which provisions the physical network into multiple logical networks across the stack, from Layer 2 to 7. Additionally, ExtremeXOS 15.3 delivers support for AVB (Audio Video Bridging), Identity Management enhancements, XNV Dynamic VLANs and GRE Tunneling enhancements. 1. Open Networks Must Be Interoperable Networks - across SDN controllers and multi-vendor physical switches and hypervisors supporting industry standards such as OpenFlow. Software-Defined Networks must address the entire network including physical and virtual switches, and though overlays deliver value today, they are not the end game. 2. Open Networking Means Vendor Neutral Platforms - support for multiple hypervisors, controllers, physical and virtual switches, network services and network silicon in a seamless multi-vendor environment with no vendor lock-in. 3. Open Networking Means Programmable Networks via Northbound APIs - abstract network Command Line Interfaces (CLI) to interface with applications and orchestration stacks to radically reduce the operational cost. Auto provisioning of physical and virtual network gear, compute and storage scheduling, and workload placement via an orchestration stack that does not require coding. The Northbound APIs should also serve as an innovation injection to speed-to-market new applications, network services and design options. 4. Increased Network Visibility and Monitoring - open networking also means visible networking so that troubleshooting, design, traffic flow optimization, and others are enabled. Open networks should emit real time network statistics to various traffic analytic and Big Data engines to determine network operational state. 5. Open Networking Business Model Needed - The industry needs to develop a business model that includes but is not limited to financial, support and service models. ONUG believes that for open networking to accelerate, the industry needs a viable, altruistic, truly open networking business model to drive innovation, fuel research and development and deliver best of breed solutions without allowing individual vendor proprietary interests to derail SDN deployments. Who will be the Red Hat of Open Networking? "Transformation in the networking industry occurred once before in the 1990s as companies migrated toward TCP/IP and away from proprietary protocols such as SNA and DECnet, and although this transition took a decade it brought the world the Internet,” said Nick Lippis, host of the Open Networking User Group and founder of the Lippis Report. "Though this open networking migration cycle will more than likely proceed similarly, the innovation and disruption have begun, and sophisticated IT leaders are in the driver’s seat trialing and beginning deployments of open SDN solutions today." Aviat Networks announced orders worth over $10 million for a combination of microwave backhaul equipment and services to support the public safety network of one of the largest city municipalities in the United States. The network supports the city's police, firefighters and other first responders on a multi-agency wireless system. Aviat is installing Eclipse IRU 600 and Eclipse ODU 600 radios to provide seamless migration to IP/MPLS and LTE while supporting the mission-critical requirements of existing TDM traffic. "The public safety LTE infrastructure will need to support the next wave of in-field crime-fighting tools, such as mobile surveillance video," say Tony Ljubicich, vice president of sales, the Americas, Aviat Networks. "This upgrade of the city's wireless voice and data microwave backhaul will deliver LTE-proven bandwidth for video as well as other real-time applications such as fingerprint matching and identity checks. Moreover, it is set to be leveraged for integration into the statewide radio system when the time comes."